It is always a good idea to keep your finances sorted. However, with so many transactions going on in your everyday life, this might become quite overwhelming. So, how can you assess your financial standing at any given time? Well, just use the personal financial statement form. This Financial Forms contains all the important segments which allow you to segregate your finances in an orderly manner and thereby calculate your current personal finances. As the name indicates, this is a blank personal financial statement form. It contains all the important sections which makes it easier for you to personalize it and then use it to make an estimate of your personal financial condition. If you are an Excel pro, you may want to check out your personal finances using MS Excel. This form has been designed for precisely this purpose and comprises of a well designed format and important formulae to simplify the whole process. 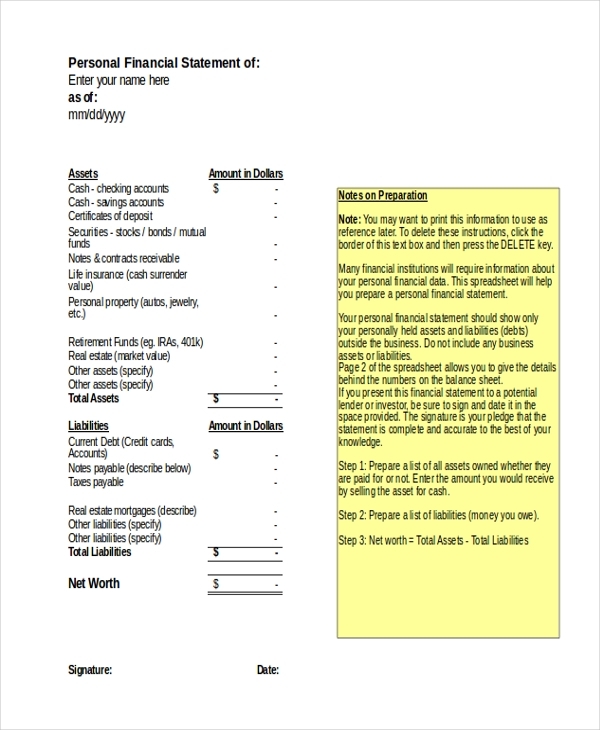 You can also see Financial Evaluation Forms. 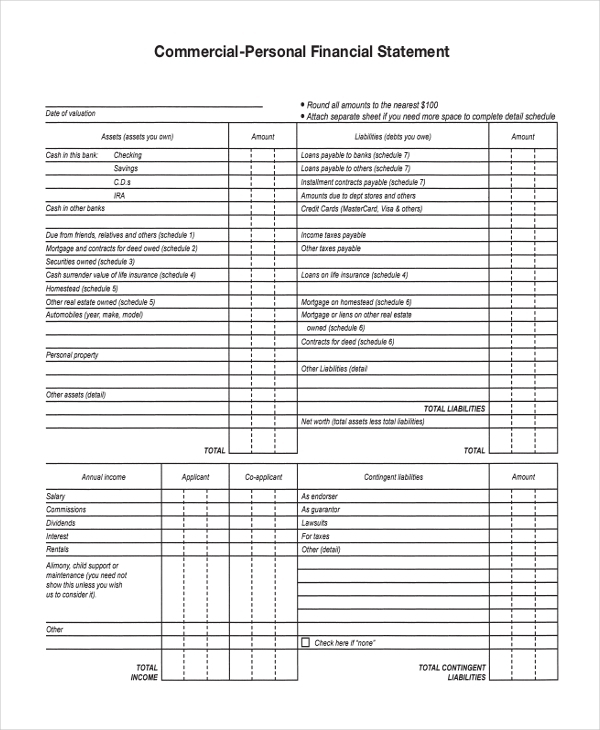 This is a basic version of a financial statement form and contains the basic sections that will give you a sneak peek into your financial condition at any given time. So, if you are not looking for extensive calculations, this will be just fine for you. 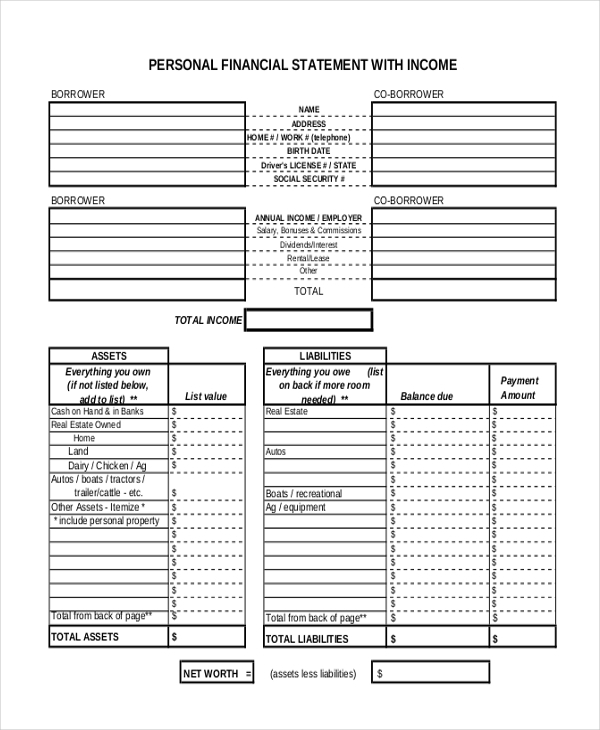 This is a standard design of a personal financial statement form and gives you an idea of the format to be followed and sections to be included in such a form. You can however make changes to it as per your requirements. 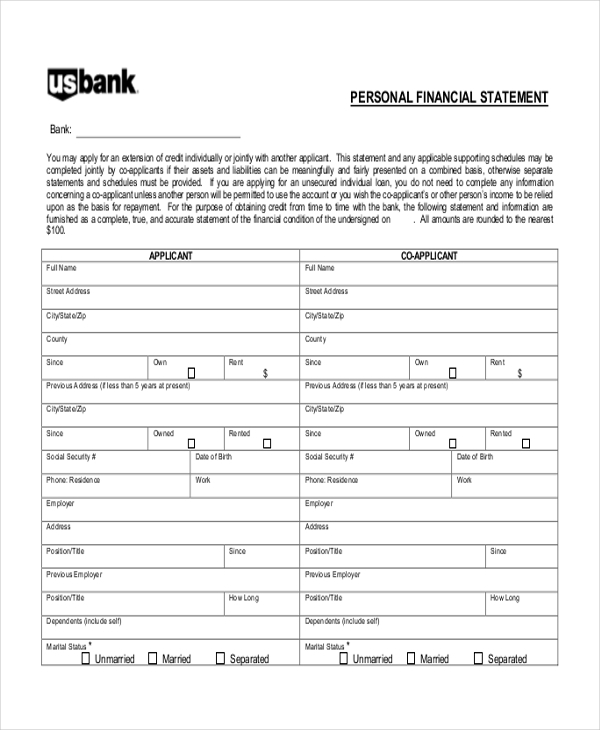 While applying for a loan, the bank may ask you to fill in a personal financial statement form, which would then be verified before sanctioning the loan. The aforesaid form is used for this purpose. This is quite similar to an Income Statement Forms and helps you to define your earnings, savings and expenditure within one document. This in turn gives you an idea of your financial position. 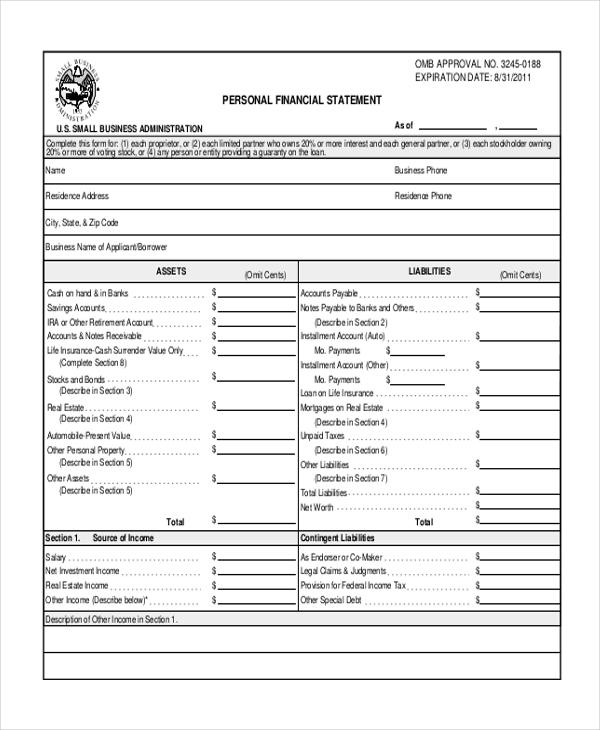 If you want to combine your Business Financial Statement Forms with your personal finances to calculate your personal financial position, then this form would be apt for your needs. With important sections in place, you can quickly add in the details and make the necessary calculations. What are The Benefits of Using Personal Financial Statements? 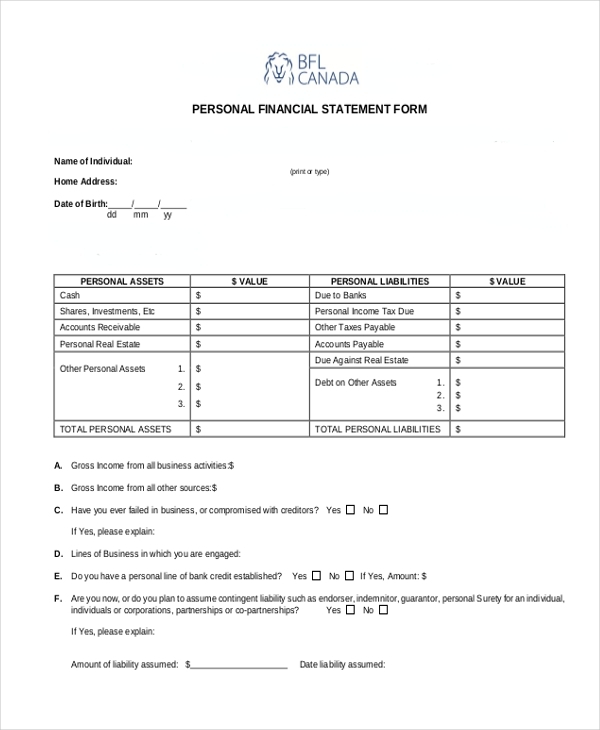 Not sure how to design a personal financial statement form? Fret not! We have a wide range of these statements to choose from. Go ahead and browse through these to find the one that will be perfect for you. Easy to download and customize, these forms help you to check out your personal finances in a jiffy. 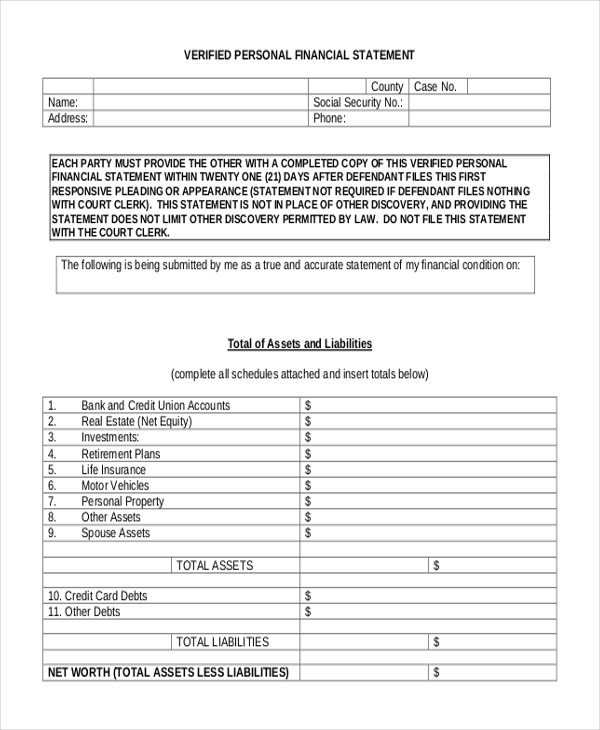 You can also see Financial Statement Forms.